Les Robinson leads a course at Randwick Sustainability Hub. 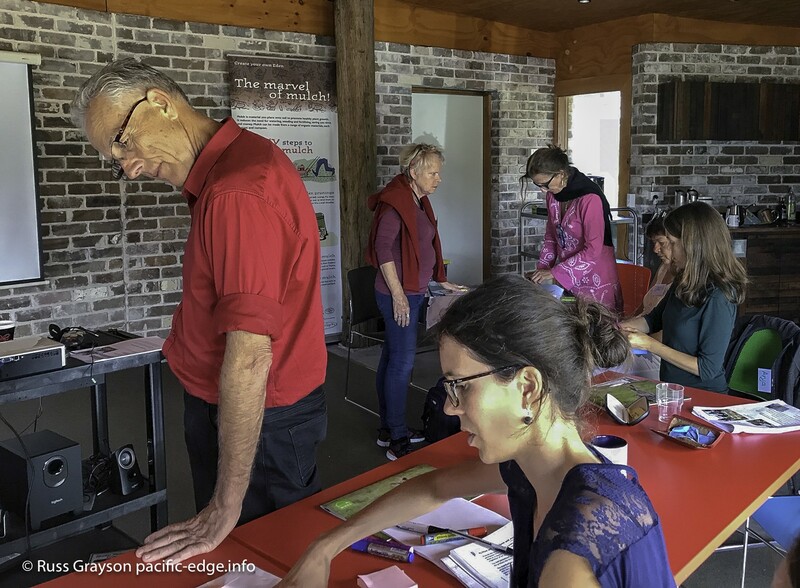 THE OPPORTUNITY FOR some passion mashin’ attracted around 30 people who clustered in the meeting room at the Randwick Sustainability Hub for a workshop led by veteran social change expert, Les Robinson. Les has worked in the social change area for decades, both online and offline, and consults on programs, campaigns and in skilling-up practitioners. Les’ workshop, entitled Passion Mashin’, was about reinvigorating your community group, about replacing humdrum activity with zest and about what it takes to grow a volunteer team. It attracted members and leaders of voluntary community associations, mainly from Sydney’s Eastern Suburbs. someone working with homeless people. Community organisations start with a flourish. There is a buzz among those starting them, an enthusiasm. They go well for a time, attracting people to talks and events and filling the organisational roles needed to keep the group going. Then, all too often, they start to fade. It becomes increasingly difficult to attract people to fill the official roles. Too many of those who volunteer stay for only the year. Fewer attend events and the organisation starts to lose its vitality, to languish. We’ve all seen this, haven’t we? That was the path of Permaculture Sydney in its first two incarnations. It was the trajectory followed by of Transition Randwick, Permaculture Sydney South and Permaculture Inner West. It is the path of community organisations in other cities. They took the path of decline rather than reinvention. Reinvention was what the Passion Mashin’ workshop was all about. Sometimes, organisations fade because key people leave. Other times it is because of automatic assumptions that never get questioned, assumptions that were valid when the group set up but that have not changed. Yet, why do some persist and continue to fulfill their mission? Why has Transition Bondi persisted as a long-running community organisation when others in the region have come and gone or persist as a much-reduced presence? My guess is because it has a clear mission that focuses on a single role in which it has developed expertise. It avoids mission creep. Its monthly events are convivial, involve learning and fulfill a social need by bringing people together. It has an enthusiastic team to organise events. People talk about those events. It is through that conversation, the interactions with people we know, that change comes. Transition Bondi also did something else. It mashed together learning, conviviality and good food to produce delight. What do we need? Delight! Passion Mashing introduces delight into the work of voluntary community groups. Delight? Yes, and you’re right — it’s seldom something that appears in the work of groups and for many it’s something well over the thought horizon. Delight occurs, according to Les, when people encounter something that is not predictable or conventional. It’s often the result of mashing together two or more different things. As an exercise, try mashing your current volunteer work with something you love… like, say, permaculture and coffee to produce Coffee Lovers Permaculture. It starts with a tasting event of good coffee and educates participants in different ways to make coffee and the story of the coffee bean from farm to cup. It is sort-of like wine tasting, only with caffeine. Delight is motivating. Delight is contagious. Community groups are often ephemeral — they come into existence as part of some social movement then dissolve when their membership falls below a critical minimum number. Some persist although participant numbers may fluctuate. Fluctuation in membership is a common phenomenon in community organisations. The personal energy that comes with supporting an organisation doing something we value is what leads to us volunteering for the internal roles that keep the organisation going. This can short-lived and that, in-part, can be out down to involvement being all business and no fun. Involvement becomes more like a workplace than a convivial, voluntary association of motivated people working towards a common organisational goal. Many of us would have experienced those groups where the same old core of people meet and stress about their inability to attract new people or to make progress in their work. Meetings become drudgery and attending them becomes not the looking forward to getting together with friends and colleagues with a common interest, but something dispiriting. This applies as much to online meetings as to meeting in-person. I had a conversation with someone who was experiencing just these symptoms in his community group. I put it to him that the group was tired, perhaps almost expired. They had earlier success organising events but that time seemed to have passed. Now they were the same small group meeting regularly and failing to attract new people. I said that perhaps the group had finished its work, that its mission was complete, and that perhaps it should be shut down. Doing that would open opportunity for the now-freed participants to move on to something new. It could be a creative destruction. The group had lost its edge, the attractant that brings people in. Like others, it was still doing what it had always done and had not questioned the assumptions underlying that. Now, it was losing out to competing uses of peoples’ time. The time demands of the workplace can inhibit participation in community groups, however in the Passion Mashin’ workshop Les pointed out that the workplace is not the greatest competition to participation. What is, are the alternative uses for a person’s spare time. It becomes a choice between the voluntary group or time with friends, watching a video, taking a walk, exercise or sport or just chilling out with a frosty glass of cold white. This is why conviviality is so important to community groups and their meetings. They need to be more social-like and less business-like. I was impressed when invited to do a talk at a Permaculture Sydney West monthly meeting how the official business was taken care of first-up and in 15 or so minutes. That opened time for the talk followed by coffee and socialising, swapping seeds and trading between members. Hint: ensure there is food and the drinks of choice. 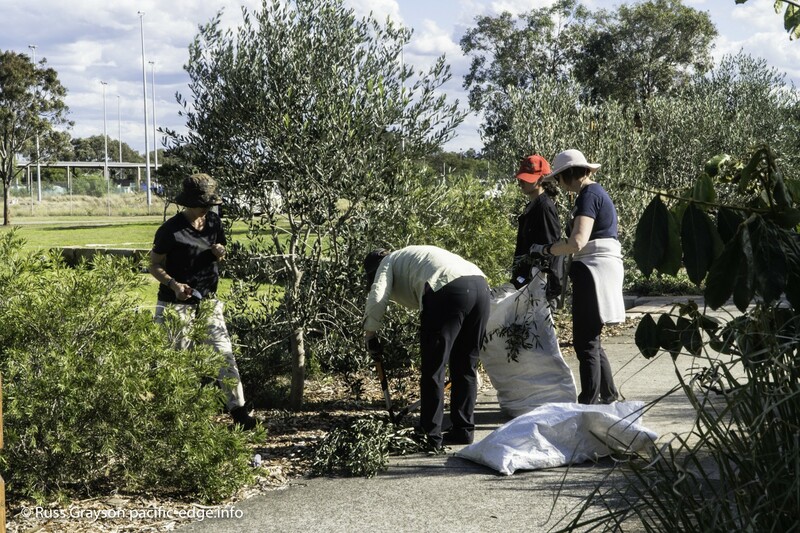 The Permabee garden volunteers team at Randwick Sustainability Hub meets weekly. Started to assist with garden maintenance in return to gaining skills from a horticulturist and from each other, the program was also established to enable social contact and reduce social isolation. Here, Permabees learn how to prune olive trees. Sometimes, groups can become so humdrum and uninspired that the only course to sustaining themselves is to reinvent themselves. That means changing what the group is and does. It’s a fundamental shift that opens new opportunities and it’s exciting because it focuses on passion — the personal passions of members and the collective passion of the group. As Les points out, volunteers seek an important cause, sociability, recognition, satisfaction and fun. If your group is dwindling and in a downward spiral, what would you do to reinvent it? How would you make it, and thus the work it sets out to do, attractive, fun, convivial? What passions can you recombine and mash? Les is the author of Changeology.